We offer reservations year-round. Depending on the time of year, most of our activities (such as the petting zoo, hay ride, and inflatables) can be added to your event. ​Our calendar tends to fill quickly, so please call today to reserve your date and get a quote! 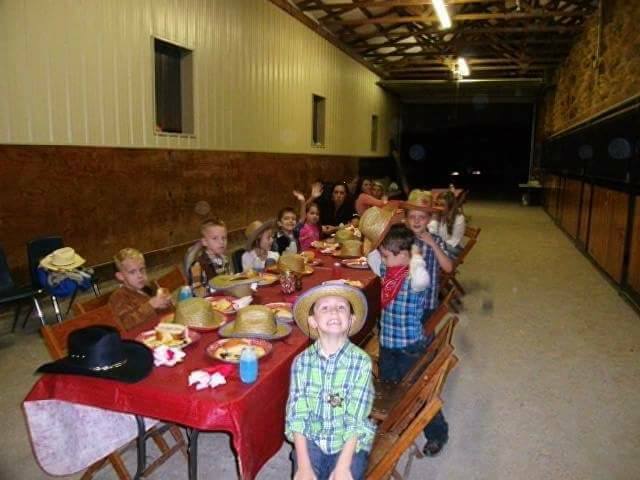 From small children to teenagers, kids love to celebrate with a unique party at Hillview Stables! Parties usually lasts for 3 hours (you can have 1 hour prior to party to decorate). Tables, chairs and tablecloths (red or blue) will be furnished. If you want a different color you may bring your own. We also offer a hot dog (with or without chili), chips and a drink for $5.00 per person. We take pride in serving our community with fun, educational experiences. We do fieldtrips in the Spring. Petting zoo, hay ride, commercial playground, 4 barrel slide, and a flower for everyone. Bring your lunch have it in the stable. $7.00 per person. We are not open to the public during these days. Your special day deserves a special location. Call to reserve your space! Our facilities can support many types of gatherings, and our services are very flexible.